With the advent of several new streaming services after the success of Netflix, it may be confusing which service is actually worth paying for. One may have a better monthly plan, but does it have enough content? Or maybe you sign up just to see the original TV shows and movies? How do you register? Here we answer those questions about SonyLIV. SonyLIV was launched in 2013 and features movies and TV shows from Sony Pictures. There is also decent original content. Shows from popular shows like SET, SAB and live TV featuring over 30 channels are available. Good news for all the Indian viewers! 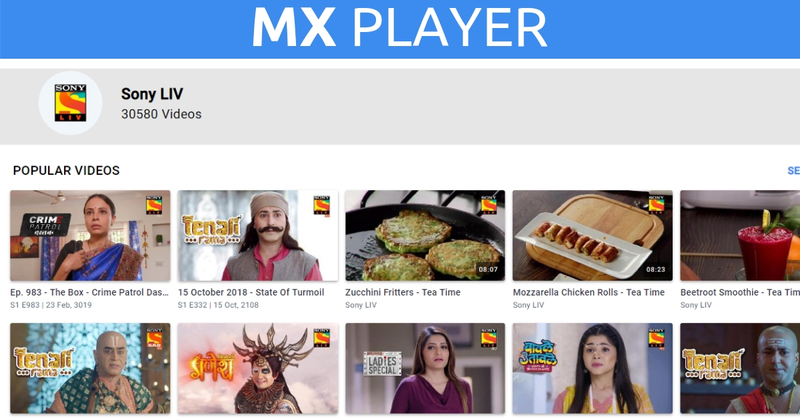 You can now stream over 30,000 videos of Sony Liv for free on MX Player. Mx player offers some of the premium content of top online streaming services for free, but with Ads. If you want Ad-free access on MX Player, then you need to purchase the MX Player Pro app. You can watch some of the premium Sony Liv content for free on either the MX Player website or download the iOS & Android apps. Open the website or the app. You need to sign in using your FaceBook ID on the MX Player app, but no sign-ups are required on the website. Search ‘Sony Liv’ in the search bar and voila! you can now stream the content for free. Note: This service is only available for India as of now. Also, you can’t download content from MX Player currently. Some of the movies in their catalogue are on ‘Rent’. These movies can be rented for 2-3 days for a nominal price and can be played as many times as needed in the rent period. Currently, PayTM is giving 30% cashback on any SonyLIV subscription, once per user on both Desktop and Android App. There are a few companies offering a free subscription for SonyLIV with their product. Sony Bravia TV offers a free 3-month subscription. So does Xiaomi on Mi TV and most Xiaomi devices(Requires MIUI version 9.5). Enter the required details including Mobile number, OTP, Name, Email Address, DOB etc. Once you’ve registered your SonyLIV account, you can browse all the free titles (which don’t have ‘Premium’ or ‘Rent’ written on the image) available. A faster way would be using your Facebook or Google account. To upgrade to Premium, select ‘Get Premium’ from the premium bar and select the required plan and payment method. SonyLIV is available on PC, Mac, all smartphones, tablets, iOS devices, and smart TVs like Sony Bravia TV and Android TV. It is, however, not currently available on Apple TV. SonyLIV website and app has a relatively user-friendly interface and is easy to use. Player control options are not available, however, which makes for a significant drawback. Registered users even have these small features like Watch Later, Favourites, Follow TV Shows, Continue Watching. There is a ton of good original content on SonyLIV, available for free with registration like “#Love Bytes” and “The Good Vibes”, each bringing something fresh and fun to the table. Meanwhile, SonyLIV also has several live channels – Sony SET HD, Sony SAB HD, Sony MAX SD, Sony ROX HD, Sony MIX, Sony WAAH and a wide range of sports channels. There’s also movies and TV shows of all genres and age groups, Bollywood and Hollywood. Sony MIX and Sony ROX HD provide live non-stop music. LIVFIT has several shows like “LIVFIT – Yoga”, “LIVFIT – Workout” and”LIVFIT – Nutrition” for all-around fitness and healthy workout. Cancellation varies with the method of payment, but it’s pretty straightforward. Credit card or Paytm – Go to the ‘My Purchases’ section on the SonyLIV website or app and click Cancel. Mobile Billing Operator – Users in India may send a toll-free SMS ‘STOP’ to 155223 and follow the instructions from the operator. Google Playstore – Go to the Playstore Account, select Subscriptions tab and click on Unsubscribe. Apple iTunes Store – Login to the iTunes store and in the Subscriptions tab, click on the pack you wish to unsubscribe from. The pricing of SonyLIV is inexpensive at only Rs 499 per year, a lot better than Netflix whose most basic package is Rs 500 per month. A lot of content and live TV is available in the free version, but there are ads and you cannot download videos to play them offline. A lot of original content is available for free on the website and several live TV channels with a 5-minute delay. Ameena is a writer, poet, illustrator and an avid fan of Marvel movies. She loves reading and writing fiction novels. When not gaming, she can be found reading a Dan Brown book or sketching something new. Game of Thrones Recap till Season 7: Where are the Main Characters? © 2019 FlickZee Blog. All rights reserved.